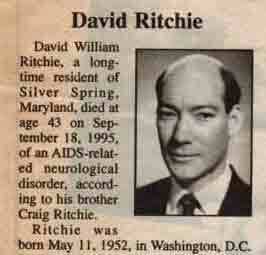 David William Ritchie, a long-time resident of Silver Spring, Maryland, died at age 43 on September 18, 1995, of an AIDS-related neurological disorder, according to his brother Craig Ritchie. Ritchie was born May 11, 1952, in Washington, D.C. He grew up in Montgomery County, Md. After graduating from Sherwood High School in Sandy Spring, Md., Ritchie continued his studies at Montgomery College in Montgomery County, Md., Westminster Choir College in Princeton, N.J., and the Royal School of Church Music in Croydon, England. In 1978, he received his choir master certificate from the American Guild of Organists. Ritchie, who began his study of music at age seven, studied under organists Elizabeth de Ayala and William Watkins. He played recitals in over 25 local churches, including four at Washington National Cathedral. He performed in Boston, Mass. ; Williamsburg, Va.; Lima, Peru; and Innsbruck, Austria. According to his brother, Ritchie was the organist and choir master at the First Church of Christ, Scientist in Washington, D.C., and manager of the Choral and Organ Music Department at Dale Music Company in Silver Spring, Md. In addition to his church music, Ritchie also served as music director, vocal coach and accompanist in over 25 musical stage shows, including a tour of England with the Gallaudet University Model Secondary School for the Deaf’s production of Godspell. “David Ritchie was a familiar and generous man with an encyclopedic knowledge of music and a million friends,” his brother said. In addition to his brother, Ritchie is survived by his mother, Elizabeth Ritchie of Silver Spring, Md., and sister, Diana Aguilar of Liberty Hill, Texas. A funeral service will be held on Saturday, September 20, at 1 p.m. at St. James’ Episcopal Church, 222 8th St. NE, Washington, D.C. Ritchie’s remains were cremated. Interment will be private. Memorial donations may be made to Montgomery Hospice Society, 1450 Research Boulevard, Suite 310, Rockville, Md. 20850.